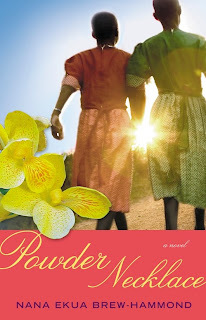 Join Ayesha Harruna Attah & Me for Up "South Stories & Sounds"
My editor Malaika Adero is the founder of Up South, Inc an organization committed to promoting global storytelling traditions. I've attended Up South events in the past before I even knew Malaika and they're always an amazing networking opportunity for writers and artists, and great fun for anyone who likes a lot of culture with their wine. 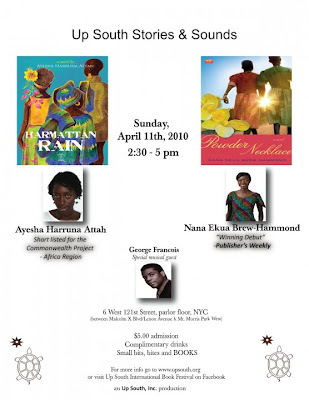 Next month, Up South is hosting Ayesha Harruna Attah (she wrote the beautiful Harmattan Rain which was shortlisted for the Commonwealth Writer's Prize), musician George Francois, and me for an afternoon of stories and sounds. You should totally come out. *The editor of the book, intent on making it more commercially viable, would insist I make changes that would bleed the soul from my work. *I would make most of these changes, hate myself for doing so, then assuage my self-loathing by reminding myself my book was being published! *The publishing company would send me on a cross-country book tour -- right after they threw me a swank book release party. 6 years. A year and a half to complete the first cohesive draft with helpful feedback from the two talented ladies in my small writing group. Another 2 years making tweaks based on the rejections and helpful feedback of several agents. A year and a half when I just couldn't look at the book anymore. (It was kind of like a literary post-partum depression.) A year of re-working the book completely based on more feedback from a generous assortment of friends who took the time to read the manuscript and share their honest critiques. How did you write the book while you worked a full-time job? I found my agent Elizabeth Jote on http://www.publishersmarketplace.com/. When I was looking, an agent who passed on my manuscript suggested I subscribe to the Publisher's Marketplace newsletter http://www.publisherslunch.com/, a free industry newsletter that announced daily news of book deals along with agents' and editors' contact emails! I pitched many agents this way. TIP FOR WRITERS SEEKING AN AGENT: Whenever I got rejected by an agent, I would always ask if they could refer me to a colleague who might feel different. 70% of them gave me the email addresses of other agents to pitch. How long did it take you to get a publisher for your book? Finding the agent took forever, but once I signed on with Liz, she sold the book approximately two months later. Needless to say, I LOVE my agent. How much money did the publisher advance you for the book? Nunna your bizness. :-) Suffice it to say I'm thankful I have a full-time job. What was the editing process like? The editing process was two-pronged. My editor Malaika Adero made constructive suggestions to improve the narrative arc of the book, then my copyeditor Carole Schwindeller went through the manuscript calling me on any grammatical errors and inconsistencies e.g. "she was wearing a sweater and skirt on page 3, how'd it turn into a jumpsuit on page 4?" No soul-compromising involved whatsoever. In fact, it was refreshingly collaborative. Are they sending you on a book tour? Not quite. You see, there have to be press people/fans of your work at these tour stops and since I'm still a youngun in this game, I'm not at that point yet. My publicist Yona Deshommes has been amazing about setting up readings and events in and around New York, where I'm based, and making sure editors of relevant national magazines, blogs and websites know about and have a copy of my book. That said, Yona just booked me at the Afr'am Fest in Virginia so I sorta feel like I'll be on tour. The main thing I've note in this process is that getting an agent or publisher has not meant less hard work on my end -- it's just meant more hands to help with the work involved. Any more questions? Feel free to ask and I'll do my best to answer. Thanks so much for reading and joining me on this journey. This is a dream come true.